In this post we are going to look at something called reinventing the wheel. Just in case your are not familiar with this metaphor or maybe you are not a native English speaker, I will use wikipedia's description of what reinventing the wheel means. To reinvent the wheel is to duplicate a basic method that has already previously been created or optimized by others. The inspiration for this idiomatic metaphor lies in the fact that the wheel is the archetype of human ingenuity, both by virtue of the added power and flexibility it affords its users, and also in the ancient origins which allow it to underlie much, if not all, of modern technology. As it has already been invented, and is not considered to have any operational flaws, an attempt to reinvent it would be pointless and add no value to the object, and would be a waste of time, diverting the investigator's resources from possibly more worthy goals which his or her skills could advance more substantially. So now that you have read the paragraph above, how many times did you write some code only to find out that it already exists in the language as part of some library or function?. How many times have you written code that you could have easily grabbed from GitHub, CodePlex and other repositories for your own use? Why write your own solution when you can use something that is robust and tested? Find out who the community leaders are for a particular skill set that you are interested in, start following these people, follow them on twitter, subscribe to their blogs and podcasts. Go to their presentations, talk to them, find out what they use, find out if they have made code available for the public to use. You will find out that a good percentage of these people have made available a whole bunch of libraries, stored procedures, functions, maintenance routines and much more for you to use and it is all free. That looks a little better than twitter don't you think? Some commercial firms will also have community editions of code and tools for you to use. Take advantage of this, these are great, if you like the tools then maybe you will find a need for the pro editions, these have more bells and whistles and are not limited. Red Gate has a bunch of free tool, you can get those here https://www.red-gate.com/products/free-tools. I started to use Red Gate's tools back in 2003, SQL Compare is the one I used the most. 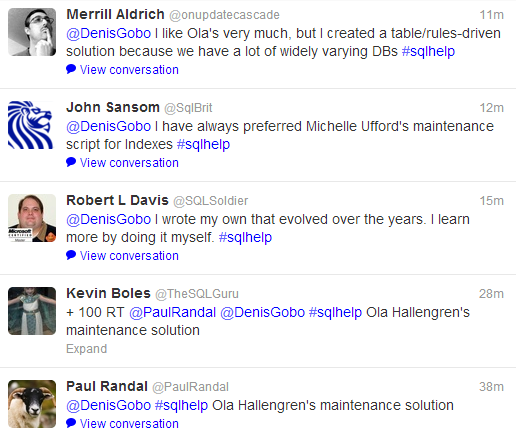 SQL Search is free and if you need to find anything in your DB it is invaluable. If you have created some cool code and you know there is nothing similar, why now give back to the community? Put it out there, solicit feedback and in the end the code will be better because more eyes will have looked at it. Accept contributions as well. All of these things will make the community as a whole grow, if the community grows then the platform will grow as well. When the platform grows, this means there will be more demand for someone with your skill set. You are responsible that your community doesn't turn into a ghost town. SQL Server 2016 added the ability to compress data yourself by using the COMPRESS function. The COMPRESS function compresses the input expression using the GZIP algorithm. The result of the compression is byte array of type varbinary(max). So the question is really wth is the uncompress function?